I hope you all had a nice weekend. Ours was unusually warm, so we were able to get outside and play for a while yesterday, which was nice. I got a lot of crafting done as well. So all in all it was a good weekend. 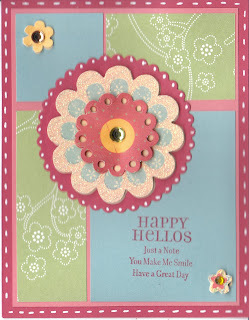 Here is the card I did for Friday's WSC from Beate. I started with a 4 1/4 x 11 piece of Ruby Red card stock which I folded in half and then I added a 4 x 5 1/4 piece of Groovy Guava. The green pattern paper blocks on the front are from an old package of SU saleabration paper. The blue is a scrap piece of Baja Breeze. Sorry, I didn't take those measurements. I used my small petite scallop circle nestabilities for the Ruby Red circle in the middle. The flower in the middle is actually one whole piece and it's from as set of K &Co flowers called "Wild Saffron", as are the two smaller flowers in the corners. The sentiment from SU "Lots of Thought" was stamped in Ruby Red ink. Finally, I added the white gel pen around the edge of the Ruby Red front and the scallop circle. Easy peasy really. Have great day everyone! Very pretty and I like that sketch! TFS!!! What a fun layout for this beautiful blossom!! Such pretty colors!! Ahh Groovy Guava, love that color! Looks beautiful and thanks for the warm welcome! TFS! What a great flower. It works so well with your layout.